Finally after finishing my Horus model I have found some time to do my first skaven! I have to say that not only this is the first skaven I have ever painted but also that this is just the first test model. I am planning to do two or three test models before settling on a particular way of painting, so that I can choose from, so expect more posts with just one tiny rat in it! 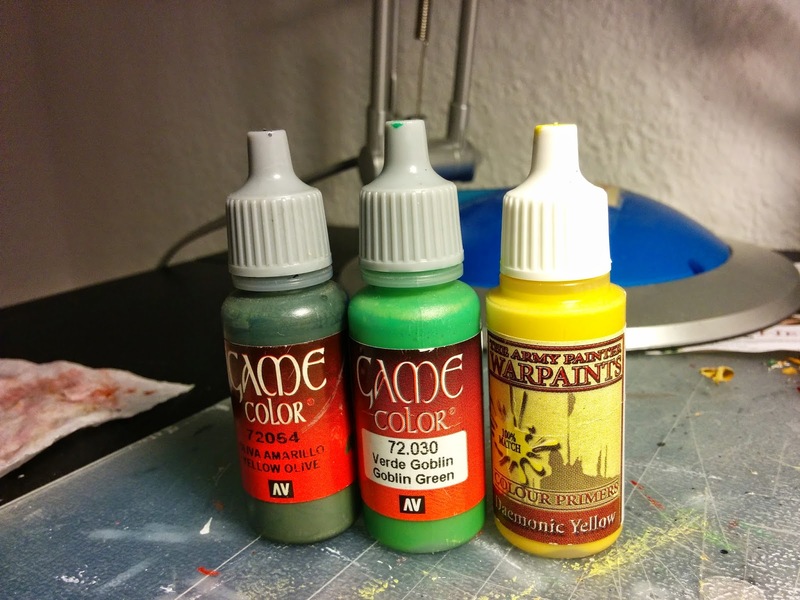 I have watched many youtube tutorials and read a lot of blog posts, specially from my fellow oldhammer skaven fans. 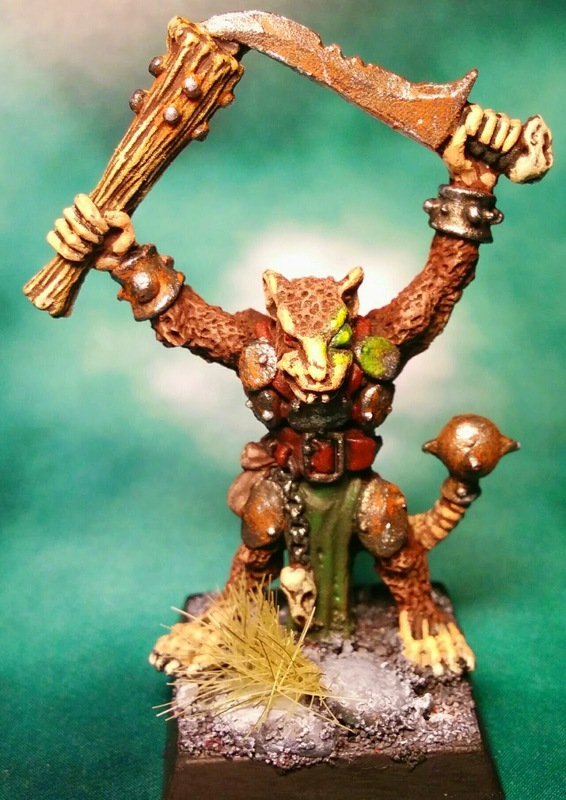 Just querying for skaven in the facebook group will render hundreds of results from which you can get inspiration. 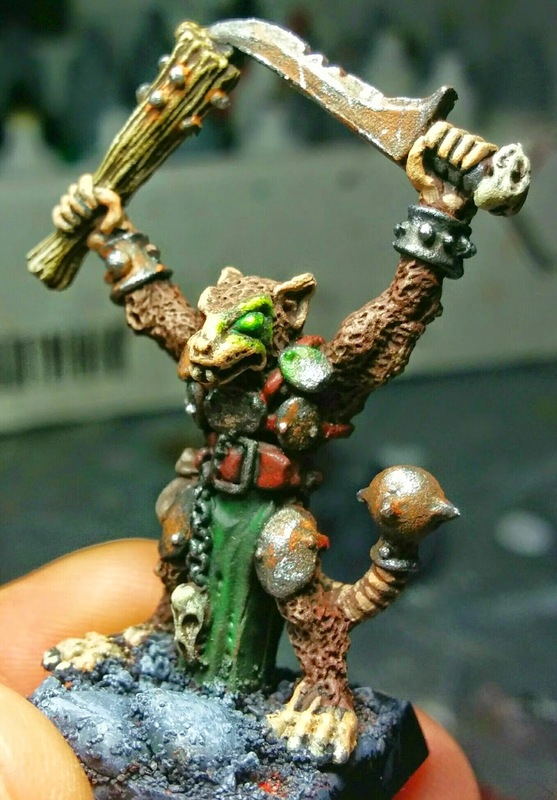 There are many ways to paint a skaven but most of the techniques have things in common, which mainly are: washes and drybrushing. 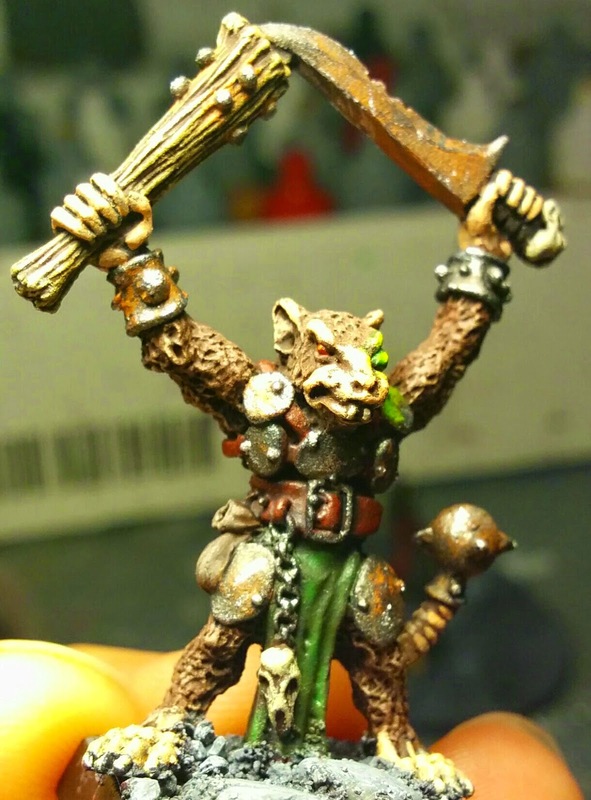 For my first test model I have decided not to use a lot of washes, and see how it looks like, keeping in mind I want to have this look similar to the famous source of oldhammer skaven inspiration: Andy Chambers. As for the base, I have to say that I would like to do the same kind of base as the one done by 24_Cigarettes in his great blog but so far I have not been able to reproduce it. I will try again for the second test. The only thing I am happy with is the grass. Having said that, here are some pictures. Just for my own record, here is the recipe I followed when painting it. So that I can later compare the different test models and be able to reproduce how to paint it. Otherwise it would not be the first time I paint something and then forget what exactly I did to get it like that! I primed the mini in black and then painted all skin with Charred Brown. 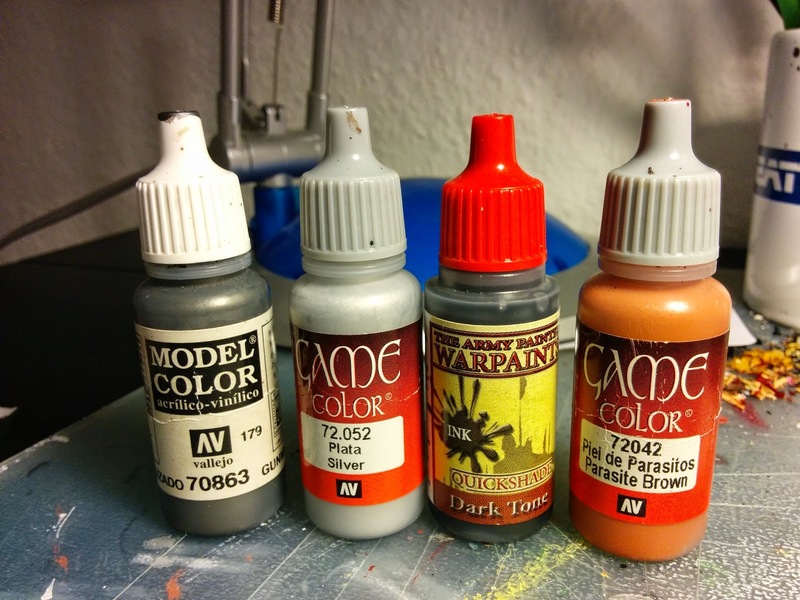 After that drybrush with Flat Brown and then Flat Brown + Ushabti Bone for a lighter colour. Then the areas of the skin without fur where painted with Dwarf Flesh (not shown in the picture). And eyes with Mephiston Red and teeth with Ushabti Bone and lights with Ushabti Bone + a tiny amount of Skull White. Same technique for the small skulls. The bag was painted with Charred Brown and then a lighter colour applied mixing it with Ushabti Bone. The belt was painted with Terracota. 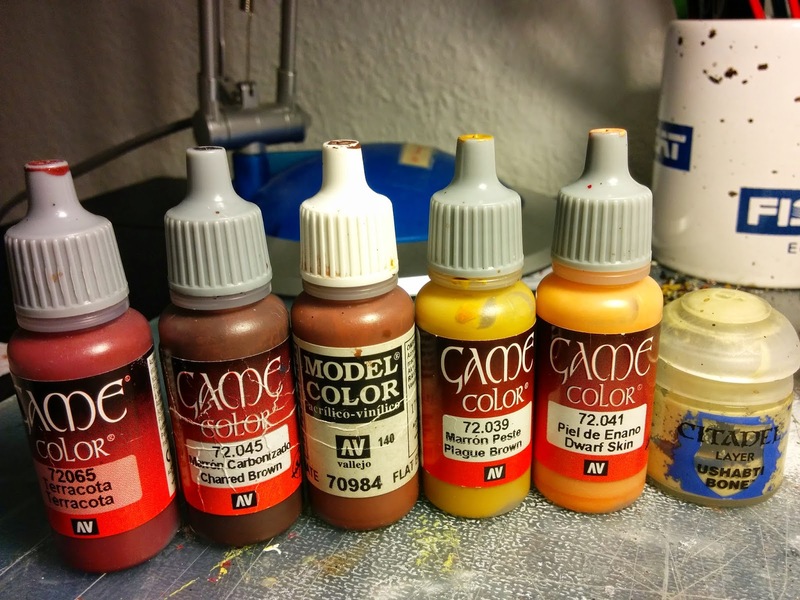 I painted all metals with Boltgun Metal, then washed with Dark Tone. After drying I applied Parasite Brown to make the rust effect and then thin lines of Silver to simulate some cuts and areas where the original metal has gone over the rust. As a last step I painted the warpstone with Yellow Green and then applied some lights mixing it with Goblin Green and finally with Yellow for the glow source. The same green technique was used for the clothes, although keeping it a bit darker. Thank you sir for the name drop. I recently read the andy chambers article review part 2 and have no idea how I was not mentioned damn my vanity. My original basing for charactwrs was done with a blob of green stuff with slivers of cork glued on and then gran sand. Now I use cork sheeting for the characters and it's never been easier. Your test figure looks great, especially the OSL. Thanks for your comment, I am now experimenting as well with cork sheets and little blobs of green stuff. Let's see about the next one!